Economists write a lot about the mystery of why productivity is not increasing, with pieces such as this. There’s even a section on it in Wikipedia. Employers wont raise wages for employees. Employers deploy technology that should result in productivity gains. Employees take the technology deployed and use them to decrease their efforts. The employer sees some productivity gains and assumes that is the limit for the technology deployed. 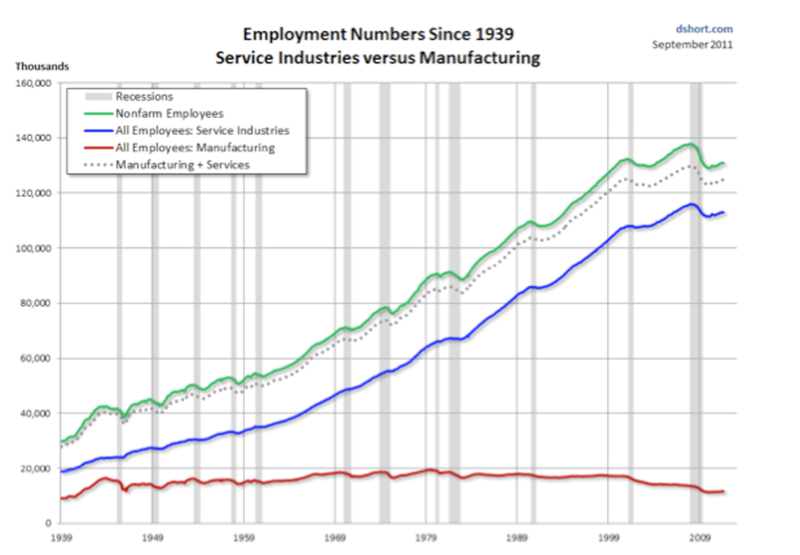 In much of the world economy, all the job growth is in the services sector (green line), not the manufacturing sector (red line). Achieving productivity gains in the manufacturing sector is more straightforward: replace people with robots and you are done. It’s not as straightforward as that in the services sector. In some services sector jobs, it is not possible to decrease effort without it being visible. But in many services sector jobs, it is. If employees cannot improve their lives by making more money, they may decide to do so by working less and working right up to the point where they don’t lose their job. If you look at employment as a game, then we currently have a Nash equilibrium where the employees know that they won’t get paid more working for the same company, because that is the best strategy for the company. Therefore the best strategy for the employee is to minimize their effort without getting fired and while showing little if any productivity gains. That’s to me is key reason why I think we have the productivity paradox. I would add that the reason this is a paradox is because no one wants to admit that this is happening. It seems like a failure on both the employers and the employees side. The employee wants to be seen as a good worker and the employer doesn’t want to admit it could be paying more. Instead technology is brought in to solve an organizational problem, which is something technology cannot do. This entry was posted in economics and tagged economics, gametheory, productivity, vox, wages. Bookmark the permalink.